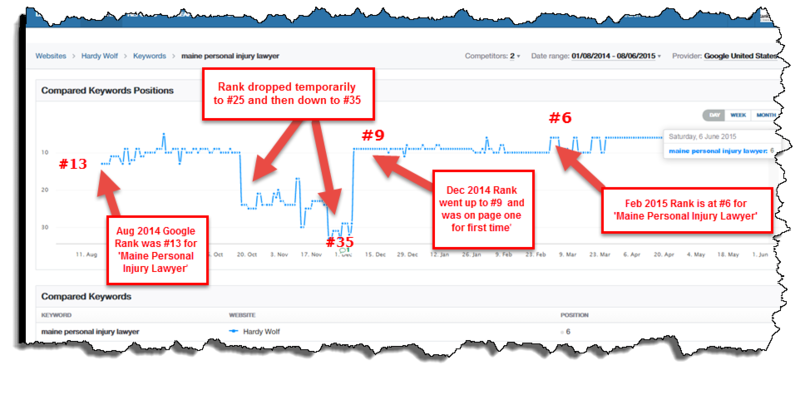 A personal injury law firm was referred to us because their most important keyword phrases fell off page one and the law firm was losing traffic. 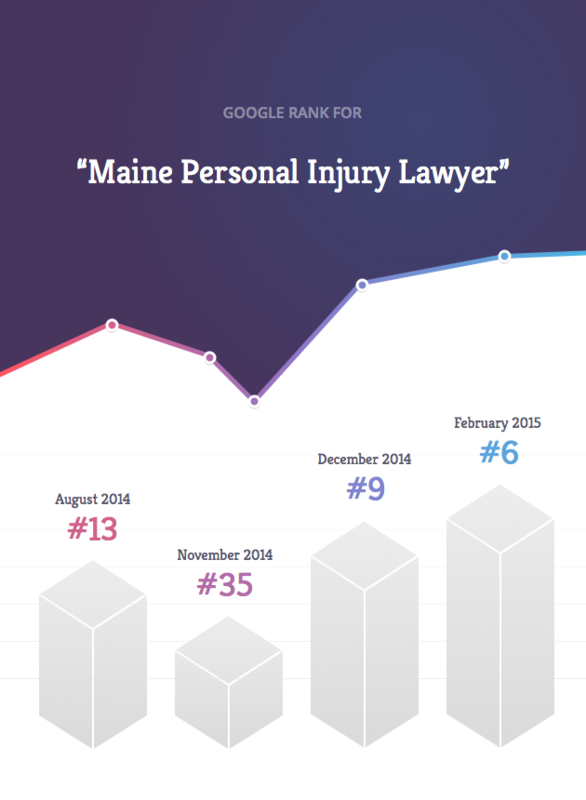 We determined the reason for the drop in rank was due to bad links with the anchor text, ‘Maine Personal Injury Lawyer’ among others. We were tasked with two requests, move the site to a new, more modern domain, and fix the rank. Not an easy task considering the keywords the firm wanted to rank for were very competitive. As you can see, when we moved the site and removed the links, the rank dropped precipitously (meaning BAD). However, 8 weeks later the rank came back, and went from #13 to #9 (back to page one) and then after another 8 weeks, jumped to #6 and became stable. Other phrases became #1 and #2. We still have some clean up to do, as it’s not easy to remove all the bad links. Moving the site, changing the content strategy and removing the links all at the same time is not for the faint of heart! Our rank was dropping and our old SEO guys were not able to fix the problems... stats were down, new cases were down. Andy and his team took over and gave our website a really beautiful look, and their team did everything. Our stats are better than ever and we enjoy working with Andrew and his team at Pink Point Media very much.